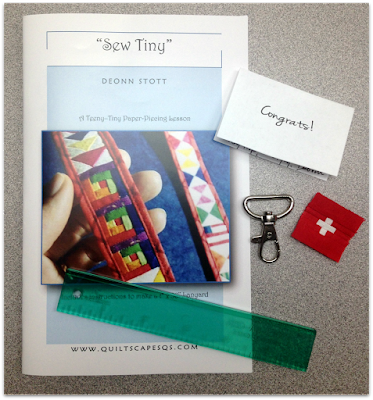 Thanks to all who visited Quiltscapes on the Small, smaller, smallest blog hop, hosted by Carol @ JustLetMeQuilt! I so enjoyed hopping from blog to blog, such creativity and inspiration! You can find the entire collection HERE. Congratulations to Martina @ Sunshine Quilting who was drawn as my winner of a Sew Tiny lanyard pattern + swivel hook, with an "Add-an-Eighth" ruler. Your package is on the way to Switzerland! 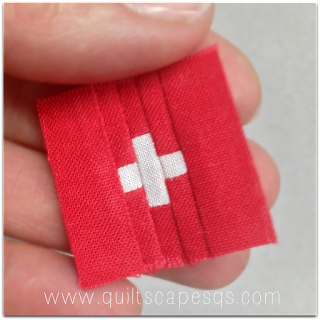 Also, I'm including a teensy little Swiss flag block to get you started! Congratulations to Martina! Those are just the tiniest and cutest blocks ever! Congratulations to her. LOVE the little flag! Oooh, that is soo sweet of you!!!! Thank you!